How can I insert/remove a link? HOME > WEBSITE AREA > How can I insert/remove a link? First you need to go to the WEBSITE tab, select the page you want to work and click on EDIT. STEP 1: In the Contents Area, select the text or the image where you want to insert the link. 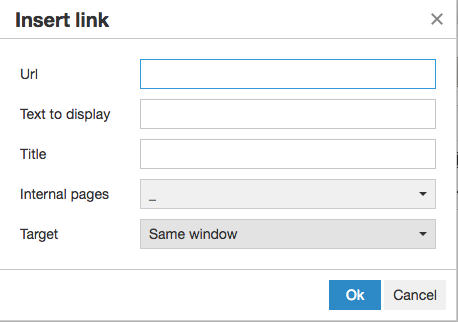 STEP 2: Now add the link in Link URL, select the Target as open in 'New window' or 'Same Window' and click OK. STEP 1: In the Contents Area, select the image or text where you have the link. Now the link was removed and you only have the text or the image. Please note that after this, you must SAVE these changes and PUBLISH so that this could be available online.